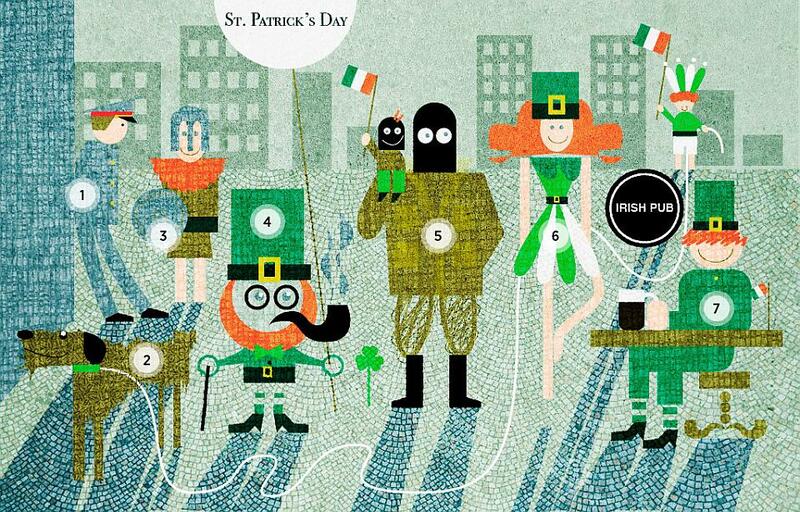 It’s difficult to imagine a St. Patrick’s Day parade without leprechauns and IRA fighters, but it can be done. But it’s not so easy without the police. True, they don’t take part in the actual parade, but they keep it safe. As a rule, the police officers are very friendly with parade participants, but during the 2011 parade – the police arrested four people who were walking along the Arbat on 10-foot-high stilts. Irish Wolfhound breeders are deservedly regarded as a fixture in the holiday parade. However, if there are no wolfhounds it’s not a problem. You can always come along with your own Irish Setter. The main thing is not to forget to put a green collar on the dog. Whichever way you look at it, St. Patrick’s Day is a historic holiday that the members of historic re-enactor clubs don’t let anyone forget. The Moscow parade takes place to the clinking of swords, axes and (a little later) beer tankards. Holidays in Russia are traditionally called “red” days, because that’s the color used to mark them on calendars. But St. Patrick’s Day is an exception. It’s a 100 percent “green day” on the calendar – as that’s the color used for regular days on Russian calendars. So far, however, no one has tried to dye the Moscow River green. In Russia, there is a widespread opinion that Russians and Irish people are fairly similar in character, but the situation is more complicated with regard to the external attributes of “Irishness.” Not everyone manages to find a leprechaun costume and a pot of gold. In this case the image of an IRA fighter, which is fairly simple to create, comes to the rescue. One Russian rock group maintains that Ireland is Jameson, Guinness and Connemara. Numerous Moscow dance schools try their hardest to remind those watching the parade that Ireland is more about jigs, reels and Riverdance. St. Patrick’s Day in Moscow brings together people of all ages. However, the wild celebrations are mainly left to the young people. After the parade the older generation prefers to have a dignified drink of Guinness in a pub.